The Wabash College Art Department presents the opening of 35 Retro: Doug Calisch (1980-2015) on Friday, September 18, with a reception from 5-7 p.m. in the Eric Dean Gallery in the Fine Arts Center. This retrospective exhibition celebrates the distinguished teaching and artistic career of Wabash College Professor of Art Doug Calisch, who has taught ceramics, sculpture, and photography at Wabash College for 35 years. 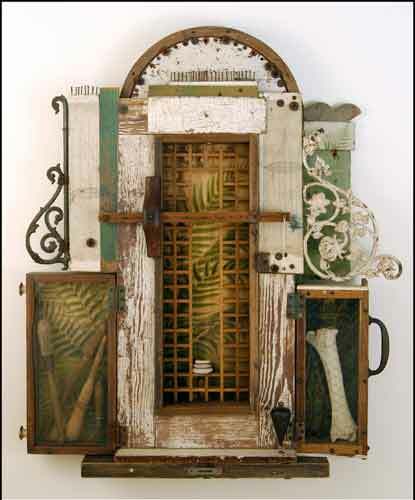 The exhibit encompasses a broad range of his art, including significant ceramic, mixed media, wood, and painted wood constructions, along with his recent wall-relief constructions using found objects and photographs. His work embodies the delicate balance between preserving an object’s history and creating new ways of looking at and thinking about forms and images. As a professional artist, Calisch continues to create public commissions and both sculpture and photographs for exhibition. He exhibits his work throughout the country and has had more than 25 solo exhibitions since 1990. His work can be found in over 50 public and private collections. Noted public commissions include, an installation for Purdue University, a work for Ball Memorial Hospital in Muncie, IN, and an outdoor sculpture for the city of Osaka, Japan. He continues to work on an ongoing series of wall-relief constructions using found and collected materials to create shrine-like assemblages. Concurrently, he photographs the locations where he scavenges the materials for his constructions. (He has received four Indiana Arts Fellowships, a Lilly Open Faculty Grant, a McLain-McTurnan Research Fellowship, and numerous awards for his sculpture.) He has been the keynote speaker at the Art Education Association of Indiana and continues as an active juror for local and regional exhibitions. The exhibit continues through December 12. The exhibit is free and open to the public and handicap accessible. The hours for the Eric Dean Gallery are 9-5 p.m. Monday through Friday and 10-2 p.m. Saturday.